More and more people are recognising the benefits of enjoying organically farmed food. 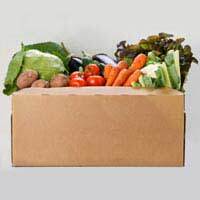 Scouring local supermarkets for organic produce can be avoided by having organic food delivered straight to your door. There are a number of benefits to eating organic food. Not only is it more nutritious but it is also free from additives and Bovine Spongiform Encephalopathy (BSE). Organically farmed food is also free of genetically modified organisms (GM) and is recognised as being more nutritious than non organic food. Organic food not only tastes nicer but is better for the animals due to strict animal welfare standards, and organic farming is environmentally friendly. Isn’t Organic Food Just the Latest Health Fad? In the last decade the organic food industry in the UK has grown by 26% each year. The major supermarkets have seen the benefit in stocking organically farmed food and many natural food stores now only sell organic. Non organic farmers have a choice of 400 different chemicals that can be used on their crops. Serious warnings have been issued by the Royal Commission on Environmental Pollution on the effects of these chemicals on humans. Consumers are recognising the benefits of enjoying GM and additive free foods and it looks as if organic food is here to stay. Didn’t the FSA State that Organic Wasn’t Any Healthier? A recent report by the Food Standards Agency (FSA) did state that organic food was no healthier than conventional food. But organic campaigners have criticised this report as being out of date. The campaigners also claimed that the report did not fully take into account the damage done by pesticides or the environmentally friendly aspect. Keep in mind that the FSA does not actually show a lot of support to smaller food producers. It is unlikely this report will change the minds of organic food lovers given the evidence available on the harmful effect of chemicals in non organic food. Can I Buy Organic Food From Local Supermarkets? A number of the big national supermarkets have recognised the benefits of stocking organically farmed produce. Not all of the supermarkets do sell organic foods and the majority that do will not have an extensive range. In the majority of cases there will generally be an aisle or two set aside for organic food. This is because organically farmed food is still seen as something of a niche market in the UK. It seems that at this time UK supermarkets are not completely committed to stocking a full range of organically farmed foods. Who Stocks Organic Food For Home Delivery? The internet has made shopping for organic food much more accessible. In fact consumers are more likely to find a much wider range of organic food available online than at local supermarkets. Natural food stores not only stock organically farmed food but also hold a wide range of other environmentally friendly products such as clothes. All of these items can be purchased online and delivered straight to the customer’s door. Are There Dedicated Online Organic Food Stockists? There has been a growth in online organic food stockists. Organic food directories are available online where consumers can find their nearest stockists. This means that the organic food will be locally produced. Farms are now seeing the benefit of going online and selling direct to the customer. This guarantees the freshest food throughout the year that does change with the seasonal crops. Unlike online shopping with supermarkets, many organic retails will deliver free of charge. What Sort of Organic Produce Can I Buy Online? With online retailers there does seem to be no limit on the kinds of food available. Organically farmed fruit, vegetables, poultry, beef, lamb and dairy products are all available. Those considering shopping online may want to start off with one of the mixed boxes from organic retailers. These boxes will contain a mixed selection of organic food that is excellent as a taster. Other food can be added to the box depending on the customer’s taste and requirements. Isn’t Organic Food More Expensive? Organic food isn’t always necessarily more expensive than non organically farmed foods. It is the case that farmers do charge a little more for their organic produce. This is because organic food isn’t mass produced and organically farmed food takes longer to produce and is more labour intensive. A farm that is converting a field for organic produce will usually see that field being out of action for three years while the conversion takes place. At the moment customers are paying extra to ensure the long term development and stability of organic farms.